You are first painter to the regiment, and your principal duty is to instruct the young academicians in the art. Your pencils indeed are none of the softest; and though you do not aim at the grace of Raphael, or the grandeur of Michael Angelo, yet you must not yield to Titian in colouring. You are also the Paris, if not the Adonis of the regiment; and every judge of discipline will estimate the goodness of the corps by the state and splendour of your trappings. 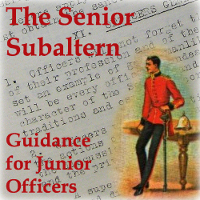 The title of Major is as applicable to you as to the Serjeant-major. You should therefore insist on that appellation from all your drummers; and as you are, in all probability, the handsomest, the finest and the youngest fellow of the two, you will be the most likely to pass for the major of the regiment. It being your office to furnish the pencils for the young painters, vulgarly called cat-o'-nine-tails, and as you are paid by the delinquents for the use of them, you may, in imitation of other contractors, put them off with second-hand ones, which by a little washing will be as clean as ever, and will be much softer to the back. If this is not discovered by the adjutant, or he is good-natured enough to wink at it, no harm is done; your customers will have no reason to complain: besides, if they do, it is no more than you are to expect, for do what you will, one may venture to affirm, you never send any of them away well pleased. Indeed this contract for whipcord might be made a very beneficial one, were it not for that unfeeling dog, the adjutant: as you could, if left to yourself, accommodate a customer, according to any price he is willing to give, from the stiffest cord to the half-twisted pack thread. If the colonel, or any other officer, has a large wolf, or bull-dog, or the regiment any tame animal that follows it, such as an ape, a bear, a fawn, or a goat, they will assuredly be placed under your care. This will be a regular income to you, and you may occasionally bring in a bill for depredations which they never committed. At a punishment, do not fail to exercise your rattan on your drummers, whether they favour the delinquent or not. It will keep them up to their duty; and everyone knows it is better to prevent an offence, than to punish it: besides, it may save your own shoulders from being rubbed over by the adjutant's towel. As you are postmaster-general to the regiment, much is to be gained from that department; and that by the simplest meansonly by charging the officers and men for letters they never had, and double postage for what they really receive. With respect to many of the officers, such as the commanding officer, adjutant, quarter-master, etc., you may safely do it, as the money does not come out of their own pockets, but is charged in the contingent bill. They will not, therefore, give themselves much trouble about the matter; and, as to the private men, you, as a non-commission officer may easily browbeat them should they question your accounts; and, in matter of conscience, as you are often obliged to trust a long time for the payment of their postage, it is barely getting a little more than common interest for your money. Besides the appointments already mentioned, you are also officially keeper of the menagerie to the corps. If the colonel, or any other officer, has a large wolf, or bull-dog, or the regiment any tame animal that follows it, such as an ape, a bear, a fawn, or a goat, they will assuredly be placed under your care. This will be a regular income to you, and you may occasionally bring in a bill for depredations which they never committed. In winter-quarters, or at any time when you have nothing else to do, flog all your drummers round. If they do not then deserve it, it is pretty certain they lately have, or shortly will: besides, correction tends to keep them good, when they are so. If you should hear of any person being dangerously ill in any town or garrison, when you beat through the streets, take care to brace your drums well, and to make a confounded noise, as you pass under their windows. This may sometimes procure you a perquisite. In marching by the commanding officer, when you beat the short troop, look as stern as possible, and appear as if you could eat him up at a mouthful. When you pitch on a place for practice in garrison, let It be as near the town as possible, that the officers may constantly hear the boys at daddy-mammy, and be thereby convinced that you do not suffer them to be idle. If it is close to a hospital, a public school, or a church, it will be so much the better; as the sound of the drums will amuse the sick, divert the boys, and keep the old women awake at their devotions.